No worries. Although the biology, terminology and classification behind the fungi is a course of study that is as beautiful as any human language, I will not try to fill this post with all that specialized nomenclature, especially since I am a novice at it myself! This particular group of fungi are polyphyletic (similar or convergent in nature, but no recent common ancestor) and have been grouped together based on their habit of passive spore dispersal. While most other fungi have mechanisms that forcibly discharge their spores, in this collection of orders the spores are passively dropped and released by rain drops, wind, insects and other animals. These fungi go by the names of earth stars, puffballs, and earth balls. The palate-pleasing truffles and the oh-so fascinating bird’s-nest fungi are also included in this grouping. The phallic (order Phallales) stinkhorns spores are spread by flies and other insects that are attracted to the rotten smells they exude. The bizarre jelly and “ear” fungi are also placed in this group. Finally, the economically important rusts (Uredinales) and smuts (Ustilaginales) also fall in this category, often finding conditions in our modern monocultures perfect and in little time can cause severe declines in yields of cereals and legumes. 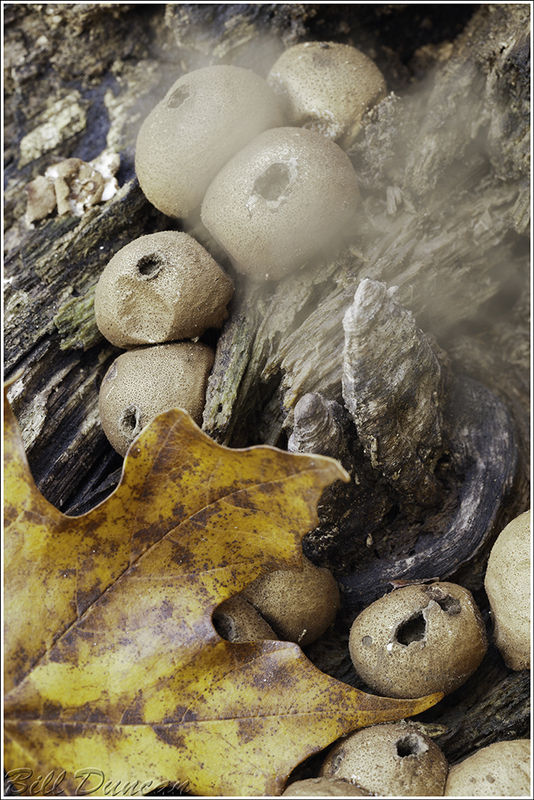 The photo here shows the “Acorn Puffball” (Disciseda sp.). In nature, the spores are forced through the ostiole (opening) when struck by rain drops or falling leaves or other matter. Often they may separate from their base and roll across the landscape ejecting spores as they move along. In this photo I used a small twig to push on the side of one of the fruiting bodies that discharged the cloud of spores I hope is apparent. This took some time and patience to get just right. I did not have any artificial light source, so reflectors and trial and error with exposure settings had to suffice. These guys are most often found in dry habitats like desserts, dry grasslands, pastures and dry woodlands.